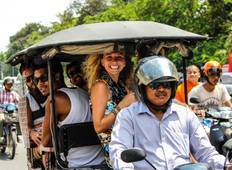 Discover Adventure Tours in Cambodia in March 2020, visiting places like Siem Reap and Angkor Wat. Book now and save with TourRadar.com! "This was my second experience of Tru Travels after booking with them just over 2..."
"Fantastic tour & great guide who made sure we had an amazing time!! Would definitely..."